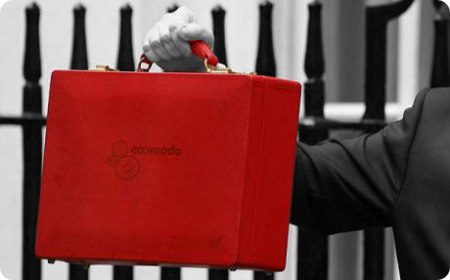 « do the green thing ..
mr osborne .. can we borrow your briefcase ? Budgets don’t need to be all about higher costs, cutbacks, abolishing hopes and dreams. We think we’ve found a magic way to cut back expenditure BUT STILL deliver more. We are slashing our budgets by 80%… but we plan to live 150%. Holidays: Instead of spending £250 on a set of camping gear for the weekend away, spend £50 borrowing it from people around you and discover a common interest in rockclimbing with Stephanie from work. Home : Reduce the cost of making those shelves from £200 for tools, down to £40, and pick up some great tips from Geoff the handyman down the road. Hobbies: Try out jewellery making before rushing out to buy the wrong tools in excitement. Save yourself £100 in the process and learn far more than the books had taught you from Steve the guy down the road who did a course in silversmithing… Who knew! After factoring in similar reductions in party, visitors, spring cleaning, special events and all other allowances we find that we’ve saved nearly £1000 and a whole load of embodied carbon. We have lived a richer life, we have new friends and we’ve got the jobs done faster and better. Look at all the items you can borrow today on Ecomodo, and post a wanted ad for anything you don’t find. Shed: We will be increasing income from seldom used tools and gear from £0 to £100. Loft: We will source a new income from the dusty stuff in the loft of £150. Me: It turns out I’m worth £150 and few beers in advice to get neighbours online and keep them there. Everywhere else: Looking in all cupboards, under the beds, in the kitchen, in the garage and in the self storage unit it seems that we have an income of £500 waiting to be discovered, an unmeasurable amount of social equity and once again many friends to be made. Be inspired about what you can lend with our suggestions. It seems that if all the parents at my son’s school do this and donate only 10% of their new income the school could make an extra £15k. If this money is donated to charity we will do some giftaidery pokery and magic it into even more. Find out more about fundraising on Ecomodo. This is a modern day alchemy. This entry was posted on June 21, 2010 at 8:39 pm and is filed under earn money, fundraise, save money. You can follow any responses to this entry through the RSS 2.0 feed. You can skip to the end and leave a response. Pinging is currently not allowed.